Get A FREE Brochure from "Exceptional Sound Mobile Music Entertainment"
Life’s biggest moments create memories. Memories made with Music become unforgettable. Your wedding day is your time to celebrate. The right music professional can make your day Extraordinary, lasting, Delightful, historic. Create an exceptional day, effortlessly with Exceptional Sound. You may have never hired a dj before. 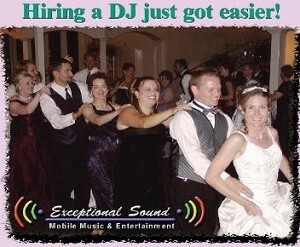 Exceptional sound has just made it easier with the free brochure “how to hire a DJ”. Your Dj has the single most important impact on your reception and Exceptional Sound has made hundreds of weddings memorable. They can do the same for yours. Please mention this ad when you call Exceptional Sound!